DOUBLE ACTION AIRBRUSH Starvin' Artist sells all products to include air brush paints, airbrush sets, air brush compressors. One of the most often statement one makes is "I want to buy an airbrush." 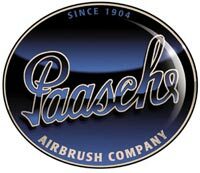 This reference from Paasche airbrush makes that choice easier. The type of action refers to the method action is required to control spray pattern. Pressing down on the button activates the amount of air flow and pulling back determines the amount of fluid released. This allows the user to change the width of line, color, and the opaqueness of color with one hand. Double Action models take more practice to use but are better for free hand detail work.